National Grid recently published a roadmap to widening access to the Balancing Mechanism to smaller, distributed assets and demand-side response. The increasing de-centralisation of the electricity system, along with the growth in intermittent generation, is making the task of balancing the system more challenging (and expensive). As the amount of flexible, dispatchable generation on the system has fallen, new sources of flexibility have emerged, but historic industry frameworks inhibit their access to the market for balancing services. National Grid, in its capacity as the GB electricity system operator (“ESO”) is seeking to address these limitations and enable these new providers to enter the market. What is the Balancing Mechanism and why does it need to change? The Balancing Mechanism (“BM”) is the period between gate closure (one hour prior before the start of the delivery settlement period) until the end of the 30-minute settlement period. During this time the National Grid can instruct (or dispatch) parties to increase or decrease their generation or consumption in order to achieve a balance between supply and demand throughout the settlement period. All wholesale market participants, generators and suppliers (except for non-physical traders) register as Balancing Mechanism Units (“BMUs”), with BMUs containing either a generating unit or a collection of consumption meters. Bids or offers – how much the BM participant is willing to pay or be paid by the system operator to increase or decrease their BMU’s generation/or consumption by a given amount. The BM typically accounts for 5-15% of all contracted electricity volumes over a year, and is used to address a wide range of other system needs beyond balancing, such as managing voltage and frequency levels. There are around 3,000 BM actions each day with an overall value of roughly £350 million per year – the cost of which is passed on to consumers – with prices reaching up to £2,500 /MWh. To be an active BM participant, a party must have one or more BMUs that are “dispatchable” by the system operator – they are able to adjust their generation or consumption in response to instructions from the ESO. BM participation is mandatory for transmission-connected generators, while those connected to distribution networks can elect to participate in the BM by entering into an appropriate contract with National Grid. Unlike generators, whose location is known specifically at the point of connection to the transmission system (“Grid Supply Point”), suppliers have consumers spread across a number of locations, so when suppliers enter the BM they register a set of “Base” BMUs to represent the consumer meters in each geographic area, called a “GSP Group”. Base BMUs are not currently used for active participation in the Balancing Mechanism. In order for suppliers to become active BM participants, they can register “Additional” BMUs which can be a collection of meters across the geographical area of a GSP Group. This approach is only available to licenced suppliers. In an increasingly de-centralised electricity system, there are a larger number of smaller generators and suppliers, that could provide balancing services, but are inhibited by the contractual and operational arrangements that were designed for a more centralised and “lumpy” system. Problems are also emerging around the other services delivered through the BM, in particular frequency response and reserve. When BMUs are providing frequency response, they cannot also be called upon for balancing supply and demand – as there is more non-dispatchable, intermittent generation connected to the system, the requirement for both frequency response and balancing is increasing, while the number of participants able to deliver these services is falling. In addition, the reserve requirements are also growing, and are projected to increase over the next 5 years potentially doubling by 2022. 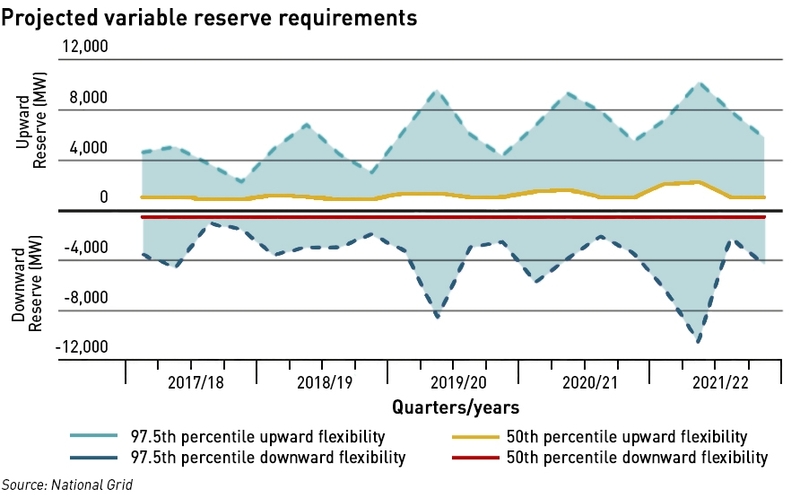 Reserve services ensure there is sufficient spare capacity available in the event of a system imbalance, and can be either upward (increase in generation or decrease in demand) or downward (decrease in generation or increase in demand). National Grid procures some reserve through tendered products, such as Short Term Operating Reserve (“STOR”), for needs that are relatively certain ahead of time such as correcting forecast errors, but there are other variable needs that only become apparent closer to delivery, which are met through the BM. National Grid is pursuing a number of initiatives to improve and widen access to the Balancing Mechanism in response to stakeholder interest, particularly in relation to greater participation of suppliers in the market. New European legislation is also driving change, with the European Electricity Balancing Guideline seeing the development of a European balancing auction platform, which will enable standardised balancing products to be traded across borders. All types of balancing service providers will be able to participate, including embedded generation, aggregators and demand side response providers. A pan-European market for reserve (the Trans-European Replacement Reserve Exchange or “TERRE”) is also being developed, which will allow providers with over 1 MW capacity (individual or aggregated) to participate. The changes arising from these EU initiatives will open up the existing GB Balancing Mechanism to aggregators and providers of embedded flexibility, independently of suppliers. The supplier route is currently the only way for parties to create active BMUs for meters registered within supplier portfolios, through which they register Additional BMUs, and are responsible for the overall energy balance of the sites where their units are situated. This is referred to as being a Balance Responsible Party, meaning they are responsible for ensuring each unit within the BMU is balanced (and will pay imbalance charges if not). Independent aggregators often do not want to take on full imbalance responsibility for these units. Modification P344 to the Balancing & Settlements Code (“BSC”), recently approved by Ofgem, will create a new route to market, where providers do not need to be a licenced supplier to create aggregated BMUs. A new type of BSC participant – a “Virtual Lead Party” (“VLP”) will be created, which can create “Secondary BMUs” with a minimum size of 1 MW. Secondary BMUs can be individual units or a collection of units aggregated across a GSP Group. VLPs will not become full Balance Responsible Parties, and Secondary BMUs will only be used for the delivery of balancing services – responsibility for ensuring units within a Secondary BMU are balanced will continue to sit with the registered supplier of each site. Parties wishing to become BM participants are required to enter into appropriate contracts with the ESO, which define the relationship between the parties relating to required systems and processes for active BM participation, and also commit parties to the relevant obligations in the Connection and Use of System Code (“CUSC”) and Grid Code which govern the cross-industry arrangements relating to BM participation. CUSC modification CMP 295 will create a contract under the CUSC for VLPs. Parties wishing to create aggregated BMUs should be obligated to fulfil similar technical requirements for similar types of units whether they are a supplier or independent aggregator. This is because similar types of units would be expected to have a similar effect on the system. Until these changes come into effect, arrangements for supplier aggregated Additional BMUs over and above existing CUSC supplier provisions will be addressed bilaterally. Wider access to the BM should allow most balancing services (otherwise known as ancillary services such as STOR, Fast Reserve, Frequency Response etc.) to be delivered through the mechanism of BMUs in the longer term. Current system and contract structures need to be adapted for aggregated units to participate. Due to the scale of the changes required across multiple services, National Grid is taking a phased approach with interim goals to ensure providers can stack as many revenue streams as possible. The Grid Code requires BM participants to have appropriate electronic communications facilities for submitting BM data to the ESO control room, and allowing the control room to dispatch the asset. The current direct communications between BM providers and the control room – (Electronic Dispatch Logging (“EDL”) and Electronic Dispatch Transfer (“EDT”) – would be prohibitively expensive and time consuming to install at multiple smaller units. National Grid is exploring new technologies as alternatives to EDL/EDT with target implementation by the end of 2019. The Grid Code requires BM Participants to submit relevant data to the ESO such as Bid/Offer data, Physical Notifications etc at the (location-specific) GSP level, which is problematic for aggregated BMUs which by nature are locationally spread. Grid Code modification GC0097 will enable the submission of aggregated BM participant data across a whole BMU, which should reduce cost and complexity for providers. Parties with aggregated Additional or Secondary BMUs will be able to send data on a whole BMU basis, over a maximum geographical area of GSP Group. Location is important in respect of local system reasons or balancing in the presence of network constraints. The location of existing traditional BMUs is known to the control room, which means the impact of any specific balancing action is also known, however, dispatch of aggregated BMUs may result in energy being delivered at different GSP locations within their GSP group area. Under the proposed changes aggregated BMUs will be aggregated to a GSP Group level to align with other types of supply BMUs, however the control room will still require information on location for these BMUs to reduce the likelihood of inefficient dispatch. Grid Code modification GC0097 requires all aggregated BMUs (for either suppliers with Additional BMUs or Virtual Lead Parties) to submit an Aggregator Impact Matrix at 11:00 hrs on the Day Ahead, indicating the GSPs where energy will be delivered. Market Participants using the wider access route will be assessed in economic merit order for dispatch consistently with other Market Participants in the Balancing Mechanism. For parties entering the BM via the supplier route in advance of the full wider access solution implementation, aggregated units with sub-units behind a live TSO/DSO constraint may not be dispatched. BM participants are required to send operational metering to the ESO to ensure the delivery of an accepted instruction to a BMU can be monitored by the ESO in real time. National Grid is exploring alternative routes through which operational metering for aggregated BMUs can be submitted, that is suitable for all types of aggregated and harnessing new developments in technology. One of the data submission requirements set out in the Grid Code is the declaration of Physical Notifications (“PNs”) – the planned profile of a BMU’s generation / consumption during a given settlement period. Once final PNs (“FPNs”) have been declared, BM participants are expected to deliver against their FPN unless instructed otherwise by the control room, with settlements being determined by Elexon with reference to these levels. This requirement will remain for all parties with active and dispatchable BMUs including supplier Additional BMUs and Virtual Lead Party Secondary BMUs. Providing and delivering in line with PNs poses a challenge for some providers – in some cases, BMU PNs would be a collation of PNs from composite sites, which may have both generation and consumption, increasing the risk of fluctuations in outturn versus the FPN. This is problematic for the ESO making it difficult to understand what a BMU will do in any given period, and could lead to non-delivery of service charges for the BMU responsible party. BSC Issue Group 7119 has been raised by Elexon to explore if alternative baselining methodologies could be used instead of the current process for determining PNs. Stakeholder feedback indicates an increasing number of providers want to aggregate smaller units, co-sited with other units behind a settlement meter. Under current proposals for wider access, only units where BMU delivery can be measured at a settlement meter level can be accurately settled financially. BSC Issue Group 7020 was raised by Flexitricity to explore how settlement can obtain appropriate metering data and allow behind-the-meter sub-sites to provide balancing services. Aggregator Flexitricity is launching an energy trading service to open the balancing mechanism to demand-side response, allowing access the market without having to engage with a traditional (generally Big 6) supplier, whose ownership of generation assets provides a conflict of interest when it comes to offering third party assets into the BM. The service is due to launch in October and will initially be targeted at businesses and public sector organisations. Flexitricity will carry out trades on behalf of customers according to constraints and instructions set out in advance. In exchange, the firm will receive a share of the proceeds. Smartest Energy also offers access to the BM to its customers. Another aggregator, Limejump Energy, recently became the first company to trade an aggregated unit in the BM, and the first to trade batteries in the market. Its 168 MW virtual power plant (“VPP”) was the first BMU to be aggregated across multiple grid supply points, and is to be increased to 600 MW over the next few months. The VPP was able to enter the BM after Ofgem granted the company a derogation from certain Grid Code requirements, enabling BMU data to be aggregated at the GSP group level. The derogation is specific to Limejump, and Ofgem said it provides “no precedent for any future derogation requests and every such request will be assessed on its own merits and particular circumstances”, however, Ofgem recently approved Grid Code modification GC0097, which will allow others to do the same. Opening access to the Balancing Mechanism will be positive for smaller generators and demand-side response, providing a new and potentially significant source of revenues. There are operational challenges in adapting a system designed for large, transmission-connected generation to accommodate many small, distribution-connected assets, and there are likely to be some false starts and teething problems along the way. The overall direction of travel however, is positive both for non-traditional providers, and for consumers if the changes manage to arrest the rise in the costs of balancing he system. It concentrates on aggregated demand side response from the domestic sector, and quantifies some of the problems. The real issue is whether the cost to solve them is worth the candle. Would you like to elaborate, maybe a summary of the thesis findings? Are the findings still relevant 6 years on? It is shown that if smart meters are to play any role in primary response then the speed at which the system frequency is measured must be increased very considerably. … The ability of the proposed smart metering system in the UK to report available demand response from the appliances to the network operator was investigated. It was found that the communication network would not support reporting demand response in near real-time. Using load profiles of appliances for 40,000 houses, it was shown that by installing aggregation devices at distribution transformers and substations, the demand response can be reported to the network operator every minute. By aggregating and sending changes only, the impact of reporting demand response in near real-time on communication network reduces significantly. So that means a whole bunch of intermediate control systems have to be installed at the local distribution transformer level, in addition to radically changing smart meter design (which probably means that even SMETS 2 meters are inadequate). That’s a lot of cost before you start adding in the control systems on appliances as well. If you look at the chart of downloads per month at the link, I think you would conclude that there are plenty of electrical engineers involved in grid design who consider the findings to be highly relevant. It’s well written, and easy to follow for anyone with a basic understanding of the issues for the most part. Download it yourself. A UK company called RLTech aggregated fridges (with rate of change of frequency devices) back in 2008 – no smart meters needed. At one point NG was paying them for around 5MW of fridges. Company does not seem to be in business – so difficult to say what happened. One thing for such – you do not need smart meters to provide FR & taking part in the BM – raises issues wrt paying for BSuoS charges – particularly if, for example, embedded gen was able to response to frequency changes. That’s interesting – I wonder what happened to them/the scheme. There are other aggregation schemes around that don’t need smart meters such as the UKPN trial of domestic solar+storage aggregation in London (http://watt-logic.com/2018/07/17/virtual-power-plant/) using sensors built into the batteries. But, as noted above, some form of additional control systems will be needed, and presumably RLTech had to install something along those lines in participating properties. Doug is incorrect. RLtec ran a smart appiance trial with frequency responsive fridges -2010/11. The energy stored was around an AA cell or two per fridge. The 6MW of comercial frequency response was from aggregated loads as a VPP in the Sainsbury’s estate. Today RLtec are called OpenEnergi. The fridge smart grid tech was part of the appliance controller. It interesting for EVs and there are obvious ways to use the Smart Meter network to aggregate the service for a responsive domestic appliance, or car. With a car, you merely need a “Smart Lead” product. Given I paid £400 for one of these, there is plenty of margin in the smart lead to more intelligently control EV and heat pump load coming to the distribution network. There is considerably more energy storage in an EV or Heat pump than a fridge. The question is which supplier is going to get this to market.